League tables detailing GCSE and A Level results for secondary schools in Lincoln have been revealed. Department for Education figures have shown that 56.1% of students in the county gained five or more A* to C grades in their GCSEs, including in English and Maths. The number is higher than the national average of 53.8% but falls just below after taking into consideration only state funded schools. Schools in Lincolnshire were however far above the average for cities in the East Midlands such as Nottingham, Derby and Leicester. 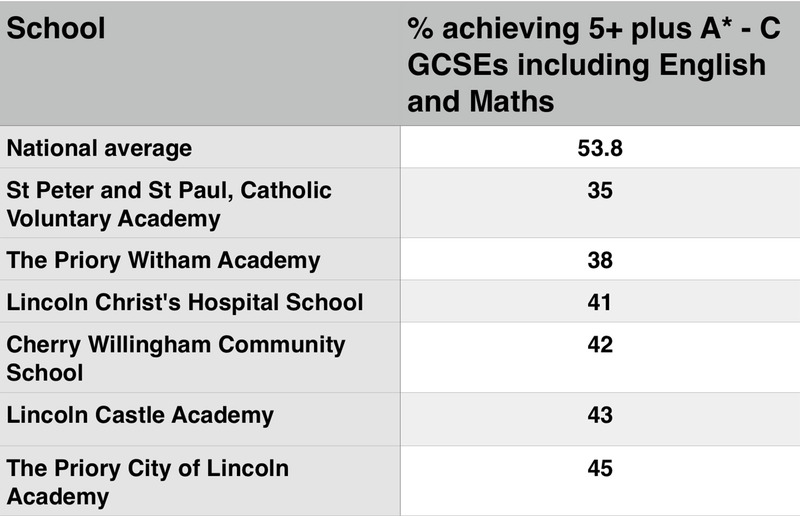 In Lincoln and the surrounding areas, the picture is decidedly mixed, with many schools far exceeding the national average but others coming up short. Those above the national average included The Priory Academy LSST, with nearly 90% of pupils receiving at least five A* to Cs, including Maths and English. Other high performing schools included the Branston Community Academy, Lincoln Minster School, and William Farr C of E Comprehensive School. Peter Beighton, head at Branston Community Academy: “We are delighted with the results. “Our students’ performance in gaining 5 A*-C grades (including English and Maths) is well into the top 10% of similar schools and we are particularly proud of the progress measure which is also in the top ten percent of all schools. “Students’ examination results are significantly beyond expectations in English, Maths, Science, History, Geography, Art, DT, PE, and Performing Arts. Andy Stones, headteacher at William Farr, added: “We are satisfied that, once again, William Farr is amongst the top tier for school performances across the region and beyond. “In both the GCSE results and A levels the school has posted results that put it amongst the best non-selective schools in the country and we are proud that we continue to deliver an excellent education for all our pupils. Despite the success of some schools, many in the Lincoln area lagged behind the national average. Schools which didn’t fare as well included the Cherry Willingham Community School, which was put in special measures in the summer of 2015, the Lincoln Castle Academy, Lincoln Christ’s Hospital School, and the St Peter and St Paul, Catholic Voluntary Academy. 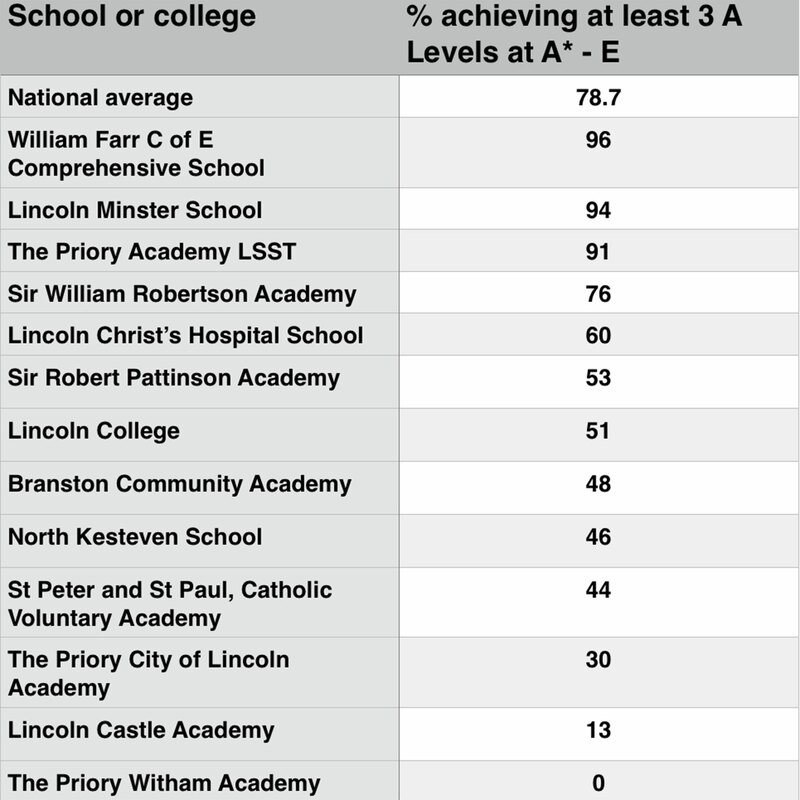 The other two schools part of The Priory Federation of Academies, The Priory City of Lincoln Academy and The Priory Witham Academy also lagged behind the national average. Department for Education figures have also revealed A Level results attained by students in and around Lincoln. 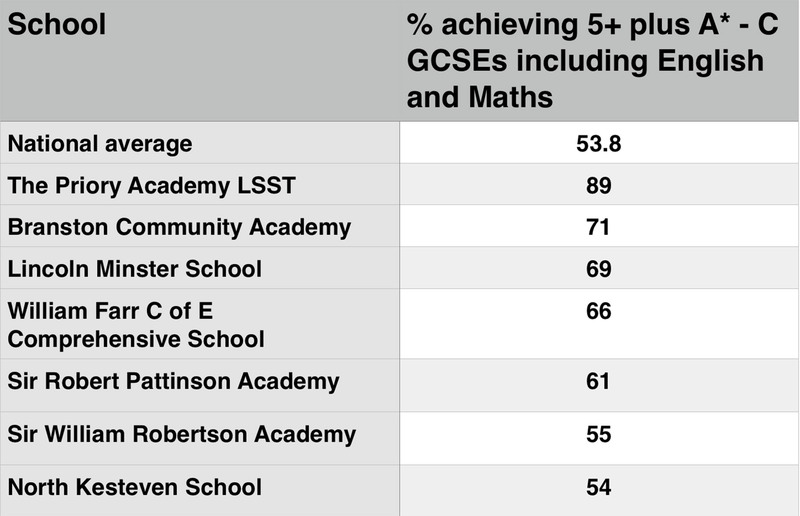 While three schools saw their pupils achieve excellent results, the table below demonstrates that a lot of catching up needs to take place for some to reach the national average of 78.7% of students achieving at least three A Levels at A* – E.
At the top of the table was William Farr C of E Comprehensive School, but at the bottom, The Priory Witham Academy, not one A Level student achieved at least three A* to E grades. Tanya Wiles, Deputy Headteacher at the Lincoln Castle Academy, claimed that the figures were “very misleading”, although she acknowledged that the information came directly from the Department for Education. She said: “The issues arise when a school has programmes of study that aren’t just A Levels. For example, at Lincoln Castle Academy 100% of our students who were entered for three A Levels achieved grades A*-E, with outstanding grades including one student with A*, A, B, one with B, B, B, one with A, B, C and one with C, C, C.
“As an academy we believe that our moral purpose is to ensure students follow an educational programme of study at Post-16 which allows them to progress to university and employment and fits their skills and aspirations.